Crime Watch: DEATH ON DEMAND released in northern hemisphere! DEATH ON DEMAND released in northern hemisphere! "Maori cop Tito Ihaka is a cop unable to play the police politics necessary for promotion, but a man who has a way with women, and he's a stubborn investigator with an uncanny instinct for the truth. Called back to follow up a strange twist in the unsolved case that got him into trouble in the first place, Ihaka finds himself hunting a shadowy hitman who could have several notches on his belt. His enemies want him off the case, but the bodies are piling up. Soon he becomes involved with an enigmatic female suspect who could hold the key to everything." 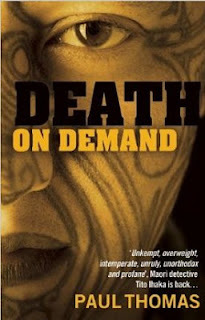 You can read a lot more about Thomas here on Crime Watch, including interviews, news, and reviews of DEATH ON DEMAND, which will be eligible for the 2013 Ngaio Marsh Award for Best Crime Novel, from last year when it was first released here. You can check out the Bitter Lemon Press edition on Amazon here.